With so many whiskies and bourbons out there, it is always hard to decide what to write about next. I am still questioning it now as I write but with a chilly start to the day I finally decided to take you back to Islay. 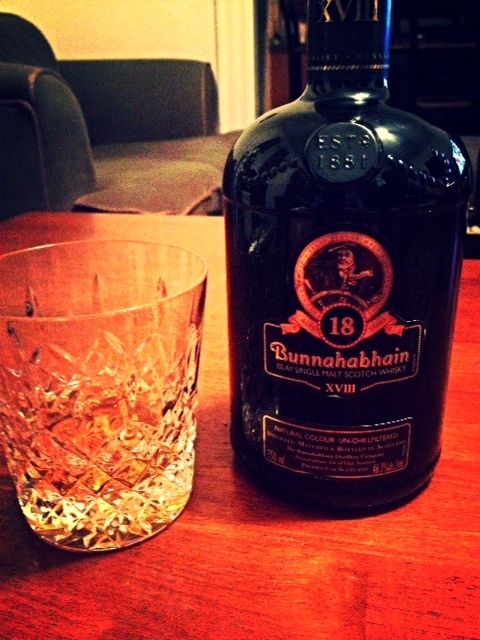 If you have not had it before I will introduce you to an 18 year old Bunnahabhain. Yes another Scotch, but no worries, my Thursday post will feature an Irish whiskey and I will include bourbon in the weeks to come. If you are like me, then you might botch the pronunciation of the name of this whisky. Looking at islayinfo.com the pronunciation break down is Boon-a-havn and the word is Gaelic meaning river mouth. This 18 year old single malt has an ABV of 46.3% and if you were to purchase, the average cost would be around $90-$110. The distillery is located in the northern part of Islay below the Isle of Jura and right above the Port of Askaig. For all those whisky lovers, getting the gift of whisky is probably pretty great, so I got a chance to taste this whisky as it was a birthday gift made to my boyfriend. I always say that it is because of all the people around me and the support they’ve offer me that I’ve been able to taste great whiskies. I found Bunnahabhain to be slightly different than any of the other Islay whiskies I’ve tasted. It’s probably the least smoky and I usually tend to associate smoke with most Islay’s. It is also not as peaty as the others. Although a very smooth whisky, I won’t say that I loved it, but I also didn’t hate it. To me it was just simply OK and to be honest, a bit forgettable. I am strong believer that no matter the review someone should never over look a whisky because my palate may be different than theirs. I have found that I’ve enjoyed whiskies that others don’t seem to like. Who knows maybe a few years from now I will taste it again and I will get different experience because we mature so does our palates. Do note that my whisky experience may not be yours, so if you’d like, give it a try and let me know your thoughts.